It turns out the “Arabic writing” is neither Arabic nor writing, and scarcely resembles Arabic writing. Rather, it looks like a stylized drawing of a sword. UPDATE: I forgot to mock the people who think there are mysterious Arabic symbols. Arabic is a language. It has writing. There are no Arabic symbols. So no job for a Tom-Hanks-style Dan Brown mystery Angels and Demons kind of *symbologist*, more’s the pity. 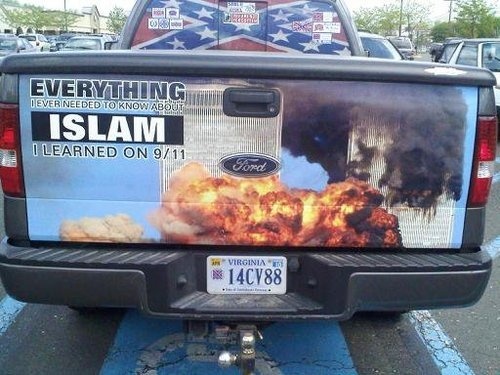 Here’s the truck of real American. Ignorant, bigoted, angry. Found at Wonkette, posted at Gawker. Both comment threads are kind of fun. Thank goodness there’s Loonwatch, a blog that has taken a lot of the wind out of my sails by doing what I want to but much, much better. UPDATE: Thanks to Gawker’s post and the comment thread about this photo, the Virginia DMV has decided this license plate with the secret hate speech is illegal. See here. From Friends of Irony, one of the many spinoffs of I Can Haz Cheeseburger, a bad joke by someone wholly ignorant of Arabic. I don’t find it particularly offensive; I can see the grain of actual humor behind it. 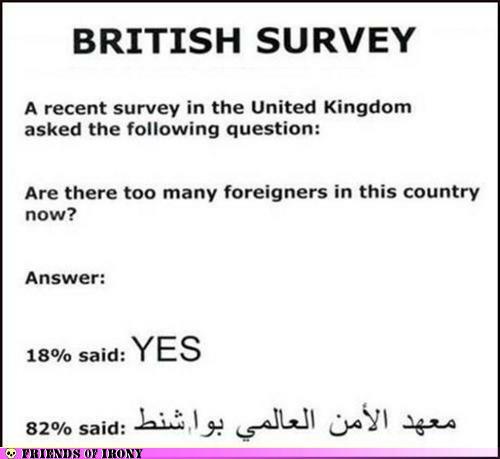 It falls apart because 1) the Arabic is obviously randomly selected from a headline somewhere and 2) England is about 3% Muslim, many of whom don’t read Arabic, and apparently the creator of this “joke” thought it was Urdu, anyway. The comments on this posting over at Friends of Irony is full of accusations of racism, of not having a sense of humor, of not understanding racism, etc. A good thread to stay out of. As of 2001, 92.1% of the population identified themselves as White, leaving 7.9% of the UK population identifying themselves as mixed race or ethnic minority. I guess the joke could have been funnier if the numbers were anywhere near realistic. Incidentally, you know some countries where the native-born are really outnumbered by immigrants? Yeah, they’re in the Arabian Peninsula. In 2009, the UAE’s population was estimated at 6 million, of which just under 20% were UAE nationals or Emiratis, while the majority of the population were expatriates. The country’s net migration rate stands at 22.98, the world’s highest. In 2008, Bahrain’s population stood at 1.05 million, out of which more than 517,000 were non-nationals. Though majority of the population is ethnically Arab, a sizable number of people from South Asia live in the country. In 2008, approximately 290,000 Indian nationals lived in Bahrain, making them the single largest expatriate community in the country. The Ministry of Economy estimates that in mid 2006 the total population was 2.577 million. Of those, 1.844 million were Omanis. The population has grown from 2.018 million in the 1993 census to 2.340 million in the 2003 census…Some 600,000 expatriates live in Oman, most of whom are guest workers from Pakistan, Bangladesh, Egypt, India and the Philippines. And so on. I will keep my eyes peeled for Arabian Peninsula “humor” about being overrun by scary foreigners.